Getting out and about with the kids is a big must do. From travelling the world and helping your little ones understand new cultures, to exploring your local area, perhaps hiking, visiting beaches, or jogging, travel of any kind is a necessity, not a privilege. Of course, we can’t deny the fact that heading out for the day with the kids in tow can be a stressful experience if you don’t have the right equipment. One piece of kit you will certainly need in your armoury is an all-terrain stroller, or a beach baby stroller. You’ll find these strollers come under many different names, but they basically all do roughly the same thing, with a few added extras thrown in for good measure. What you need to do however, is pick the right one for your needs. It’s no good throwing money at the first product you find, and it’s vital to do your research, to ensure that your choice is the best all-terrain stroller for your needs. Thankfully, we’ve done the hard work for you, and reviewed some of the most popular best all-terrain strollers out there on the market. 2 What is an All-Terrain Stroller? What is an All-Terrain Stroller? A regular stroller is just not going to cut the mustard when you’re on the beach, heading over rugged roads, or if you’re venturing to different locations, where tarmac isn’t the road covering of choice. If you stick to your regular all-purpose stroller, it’s likely the wheels are going to be worn out much faster, and you won’t have access to all the extras which come with choosing a specific type of stroller for your travel needs. All all-terrain stroller generally has much tougher wheels, usually three or four tyres which are air-filled and are suitable for all types of road, be it rough or smooth. The front tyre is also likely to swivel, for extra ease of movement. Within this product umbrella you’ll find very similar products, such as an umbrella stroller, a beach jogging stroller, and all manner of other more specific types of equipment, but it’s vital that you look for the specific features you will need for rougher terrain. By ‘rougher terrain’, we also mean sand! Have you ever tried dragging a regular stroller over a beach? It’s not easy. 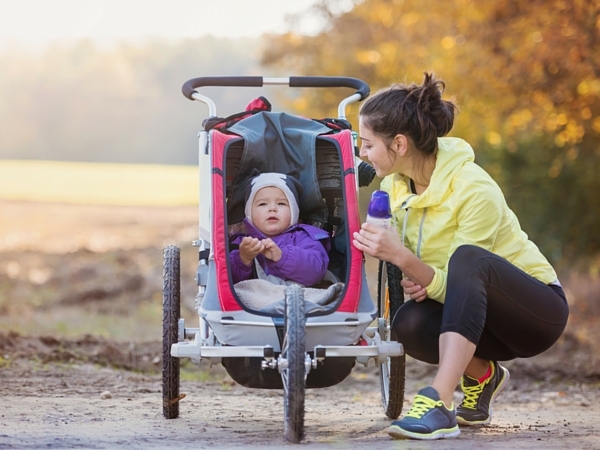 It’s worth mentioning that if you’re looking for a jogging stroller, do check the manufacturer’s advice as not all beach or all-terrain strollers are suitable for jogging. The slight downside of this type of stroller? Whilst they are certainly ideal for different types of terrain, as the name would suggest, they can be a little heavier and bulkier than a regular stroller, mainly due to the tyres. This is simply something to bear in mind. Before you begin your search, identify what type of usage you’re going to focus on. It is that you need to find the best stroller for a beach vacation only? Or is it that you want something which ticks many boxes, e.g. going to the mall, heading out walking on hiking trails, and beaches too? This will help inform your decision. Is it car seat compatible? – Some beach baby stroller choices are carseat compatible also, which is ideal if your child has fallen asleep and you don’t want to wake them during the transfer! It’s also vital to find out which carseats the stroller is compatible with, as this could come down to make and model. What is the age range suitability? – If the stroller is suitable for a child under six months then it will need to be able to recline to more than 150 degrees and it will also need to have a safety flat at the bottom, so they don’t slip out. Most beach strollers and all-terrain strollers are quite wide in their age range, but this is a point to bear in mind. Manoeuvrability – How easy is it to manoeuvre the stroller? Does the front wheel swivel? How easy is it to walk uphill and back down again? Bear in mind the weight and size. Does it fold up? – How easy is it for the stroller to fold up, and does it stand up when folded, for easy storage? An all-terrain stroller can be bulky, so ease of storing it away is vital. What is the weight? – If you’re going to be travelling a lot then you need to go for the most lightweight choice you can find. Safety features and rating – Safety should always come first, so always do your research into the safety rating and reviews of how safe it is. Does it have a five or three point harness? Five is always best, as a three point harness will only secure the upper body. When you’re moving over rough terrain or even sand, you need your child to be secure within the stroller. In addition, does it have a sun canopy, to protect your child from the sun? This is vital when you’re on the beach especially, and your little one wants a snooze, or you’re driving for a long period of time. Does it have one touch brakes? – One touch brakes are much safer than regular brakes, and that is vitally important on uneven ground and rougher terrain. In addition to this, they’re simply just easier to use too. How much storage does it have? – If you’re venturing to the beach or out for the day, you’re going to need more in the way of storage, so does it have extra storage under the seat? Does it have saddlebags? Does it have larger pockets? This is a feature to look for. In addition, does it have a tray for you, e.g. to put a drink on, phone, or keys, and does it have a tray for your child, for a drink or toys? Is it height adjustable? – For your comfort and to enable you to control the stroller properly, it’s best to opt for a stroller which has an adjustable handle height. These are all features to be on the look out when you’re trying to find the best beach strollers on the market. A big named brand certainly helps when it comes to finding a top quality product, and this one is a very well-reputed company to go for. This is a great choice as a best stroller for beach sand, simply because of the huge wheels, but it will also suit rougher terrain whilst out walking too. With safety features and all manner of extras, this is a great option to look into, although the slightly bulky appearance may put some buyers off. We mentioned the wheels, and they are certainly the main feature. This stroller has three wheels, and the front has a swivel action, which makes manoeuvring around much easier. Because of that fact, we have to put this down as one of the best beach strollers, despite it’s quite bulky nature. The other features include a reclining seat for comfort and safety, a five point safety harness which is adjustable, meaning your child can grow with the stroller, and a removable tray on the front with two cup holders. There is also a built in toy steering wheel! Storage-wise, this stroller has two cargo bags which can be removed and a large basket underneath, so you’ll have plenty of space. 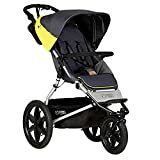 Overall, this is a great baby beach stroller or all-terrain stroller choice, and especially great for long days out, thanks to the dependable wheels and the plentiful storage. This BOB jogging stroller is another big named brand, for extra peace of mind. This is actually a jogging stroller, but the standard makes it ideal to double up as an all-terrain or beach stroller too. With an attractive, lightweight design, you can zip along the pavements with your jogging shoes on, but you can also head out for longer days on uneven tracks too. In terms of whether this would be best for beaches, it would depend on the depth of the sand, but in terms of general uneven terrain, it’s a good option to go for. The tyres aren’t as bulky as some of the other options we have reviewed, but their ‘zippy’ nature is actually a pro point. There are three tyres and the front has a swivel front mechanism, so you can move around with ease, and turn corners much easier than without this option. The tyres are air-filled, and they have the same type of suspension system that you would find in a mountain bike, which gives your child a much smoother ride for extra comfort. The handlebar is also height adjustable, which gives you more control and less chance of an aching back after a long day. There is a hand-brake on the handle, which means you can control the stroller when you’re heading downhill much easier. Again, this is for extra control but it is also an extra safety feature too. Other notable features include a seat which reclines to an almost flat position, and can be reclined with just one hand, a padded sat with ventilation built-in, a large sun canopy, and a two step folding mechanism. The stroller also stands up when folded. 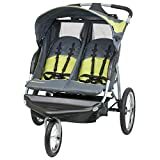 This is a great option for parents who want a lightweight, easy to fold stroller, which is also comparable with rougher terrains. In terms of beaches, it isn’t out of the question to use it, but the tyres are more for flat surfaces, than sandy conditions. 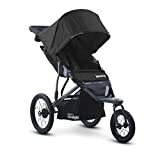 This is another jogging stroller per se, but the features really make it a great choice for many different situations, including for use on the beach during your upcoming vacation! 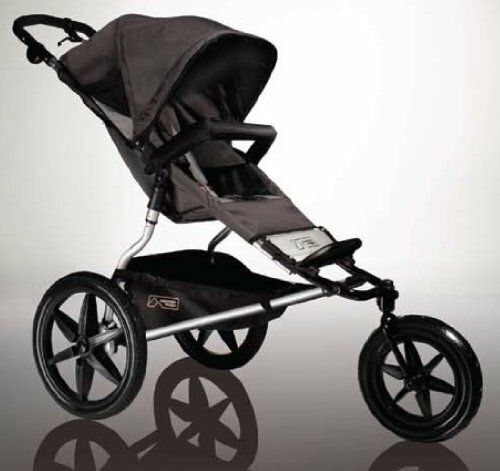 With a light weight design, as far as an all-terrain type of stroller can be, this is an attraction stroller to go for. There are three tyres on this stroller, and the front wheel is a swivel lock design, which gives you more control when you’re out and about, whether you’re walking or jogging. The high tread on the tyres is also good for beach use too. The swivel mechanism basically gives you a quicker sense of movement, but you can also control it all too, which of course adds up to a safer journey for the both of you. The tyres are also protected with shock absorption, so your baby/infant isn’t going to feel any vibration or jolts whilst they’re sleeping or simply sitting, and you’re travelling over slightly bumpy terrain, including over beach sand. Of course, this is more comfortable for you too, as the vibration isn’t going to travel up the stroller to your hands. There is also a one control brake on the handlebar, for extra control and safety. This is a stroller which his ideal for any age, as newborns can easily be comfortable in the reclining seat, and it is also comparable with most infant car seats. There is a reversible liner included with your purchase, for easy cleaning, as well as two bottle holders and a bumper bar. The stroller also folds up quickly and easily with one hand, and stands when it is folded. The sun canopy keeps your little one shaded, and there is plenty of storage space, both under the seat and to either side. 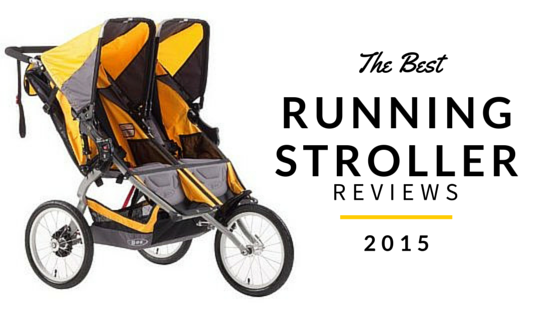 Overall, this is a great jogging stroller/all-terrain stroller to go for. The thicker and stronger wheels mean that you can easily head onto the beach, as well as zip your way around on your jogging adventures. The lower cost of this particular stroller is a plus point, but it also has plenty of advantages to make you wonder why it is so cheap! This is another jogging stroller, but one which has enough strength within it to be able to use it in many different situations. It is also a very strong stroller choice, despite it’s lightweight nature. This is another stroller which has the three wheel design, with a swivel front wheel which locks straight if you want to continue your journey in a straight line, with extra control and stability. This particular mode is ideal for using on a beach, when traversing over the sand. The lock is also better for slightly uneven ground, but can be unlocked when you want to use it for its named meaning – a jogging stroller. The seat is extra wide, which means your child is going to be comfortable and have plenty of space, however that doesn’t make it particular ideal for smaller children or newborns. There is multi-position recline for comfort, but the seat is designed to give your child extra visibility and to be able to see the place you’re travelling through. Due to the lower price, there aren’t a huge number of added extra features included with this stroller, but it certainly does what it says on the tin. There is a large storage basket underneath the.seat, it folds up easily and is very easy to clean. The suspension is also designed to absorb shock, for a comfortable ride for the both of you. This is a great jogging stroller with difficult terrain capabilities, and especially for those on a budget. The lack of all singing, all dancing features may not be an issue, if you simply want a basic design which does what it says on the tin. The thinner wheels on this particular stroller might have you thinking that it isn’t going to be ideal for rougher terrain and especially not for beaches, but it’s actually a very misleading thought! Many users state that this jogger is ideal for such situations, as the tyres are actually designed just like a mountain bike’s tyres would be. With a three wheel design, and another swivel front tyre, this stroller is basically ideal for any type of terrain and is quite useful on beaches, although not so much in deeper sand, when it may begin to struggle and literally ‘beach’. The back wheels are larger than the front, which adds stability to your journey too, whilst the front wheel is lockable, for extra control. You can easily pump your tyres back up if they begin to show signs of slacking too. The seat is another major feature on this particular jogging/beach stroller. There is a multi-position choice for comfort, and a padded seat which allows air to circulate within the stroller. There is a five point harness too, so your child is safe and secure, especially over bumpy pavements. Other notable features include a parent tray on the back which has two cup holders and there is also plenty of storage underneath, with a large, mesh basket. The stroller also has a child tray which is removable, and the whole stroller is easy to fold up and store away. The sun canopy completes the features list. This is another jogging stroller which doubles up as a great all-terrain and beach choice. While the suspension/shock absorption might not be as fantastic as on some other strollers, this is still a great choice for those on a budget. What do you do if you have more than one little darling? You buy a double stroller, that’s what! 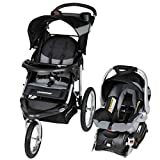 This Baby Trend version of the jogger stroller is a great option for those who want to get out and about on various different types of terrain, and is a great choice for he best beach double stroller. With a smart design, this stroller still has the sturdy three wheel design, with the swivel front wheel, which has the lockable mechanism for extra control. This is ideal for using on a beach, and despite the size of this all-terrain double stroller, it moves over sand quite well. The tyres are the same as you would find on a mountain bike, and have a rubber pneumatic design, which can be pumped up. The stroller is designed for children who are six months and upwards, and no more than 50lb in weight each, with a total weight of 100lb for both children. This means you can easily allow your children to grow with the stroller, and the versatile nature means you should be able to use this product for most situations. The seat has a five point harness on both sides, for extra safety, and multi-position recline; you can easily have one child laid flat, and the other sat up – they don’t have to be the same, which is a great added extra. The brakes are foot activated, but not a one touch system, which could be a down-side, however most double strollers are designed in this way. There is a large storage basket, and a parent tray on the back, with two cup holders. Overall, this stroller also folds up quickly and easily, and is compact once folded. This Graco all terrain stroller is an ideal choice if you already have Graco products, such as car seats. This is because the stroller easily connects to such products, with a one step attachment feature, making life much easier overall! Aside from that, you’re getting peace of mind with the huge named brand, as well as many features to make the purchase worthwhile. Again, there is a three wheeled design, with a swivel and lockable front wheel for extra control over different types of terrain, including sand. The tyres are also air-filled and rubber, which means they absorb a lot of shock and vibration the stroller may be travelling over, giving a more comfortable ride for both you and your child. The stroller also folds up quickly and easily, with an automatic lock for storage. The stroller is also able to stand on its own when it is folded up. This is an ideal added extra for travel, but also for daily use, when you don’t want your stroller taking up too much space in your home or garage. Other useful features include a parent’s tray on the back, which has a cup holder and also a cradle which is designed to hold your phone or MP3 player, whilst you’re out jogging. There is also a storage compartment within the tray, which covered against the elements. For extra safety whilst you’re out and about, there are reflective sections on the stroller for visibility in low light conditions. If you already have Graco products, e.g. car seat, then the compatibility of this stroller will be the major selling point for you. Whilst the stroller is a little bulky compared to some other similar products, it is a great option for daily use, and perfect for various types of terrain. This is certainly something totally unique to the other products we’ve reviewed so far, but a very useful option to go for! This is the ideal wagon for beach use, as not only is there plenty of storage space, but it’s super comfortable for your child too. The wagon is quite lightweight and compact, despite its size, and it folds up easily to fit into tight spaces when you want to store it away. Made of 900D polyester, it is a durable and long-lasting product, and the dual adjustable handles mean you can adjust it all to a comfortable fit for you whilst pushing it. The overall capacity is 110lb, which is certainly a good amount! 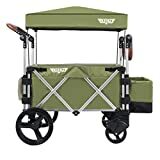 This wagon has a retractable, peaked roof, and a sunscreen made of mesh, to keep your little one cool, as well as anything you’re storing within it. The brakes are also step designed, so they’re easy to use. Within the wagon there are two, three point harnesses for safety, and high sides. This is the ideal product for those who don’t want to go down the regular stroller route and have a lot of belongings to transport with them on their day out. Perfect for a day out on the beach, this wagon is a great investment. Hopefully, by this point, you will have a much clearer idea of what beach strollers and all-terrain strollers are, how you can use a jogging stroller for the same purpose, and what to look for when buying one. Everyone is different, so the choice really will come down to your own personal preferences, but always remember to heed advice, reviews, and double check features before you part with any of your hard-earned cash.